A battle between a Buzzfeed reporter and DeAndre Cortez Way, the rapper better known as Soulja Boy, is brewing over privacy, fraud, and, of course, hoverboards. Both Berstein and Soulja Boy confirmed that Bernstein had originally texted Soulja Boy for a comment on the story. 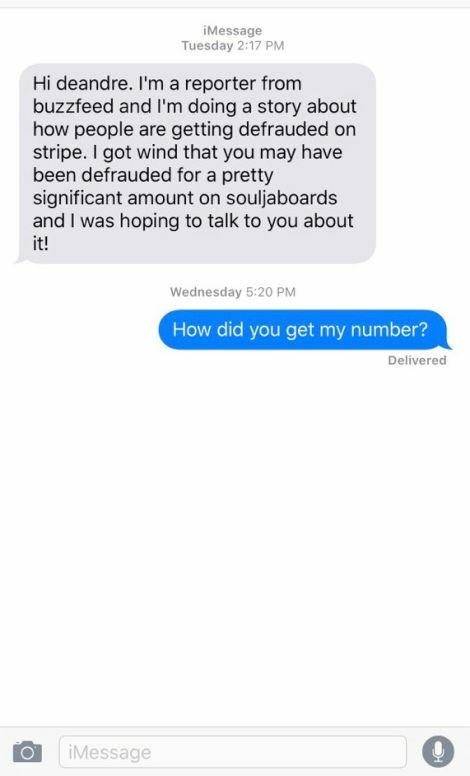 Naturally, Soulja Boy’s 4.8 million fans reacted by incessantly calling and texting the number, thinking it was the rapper’s.
.@souljaboy tweeted my phone number because he's upset w a story i wrote. i am being harassed by 100s of his fans. please tell him to stop. Bernstein says that he can’t turn his phone on now because so many fans are trying to FaceTime him. Soulja Boy, for his part, doesn’t know where Bernstein got his emails from, and accused the reporter of hacking his email in a now-deleted tweet. He is still upset about the story, and feels that publishing his emails is an invasion of his privacy (Bernstein would not talk about his sourcing, but noted that if was going to break the law, “it would probably be for a better reason than to write about hoverboard fraud”). Despite the setback, he says that the fraud charges are being handled and reversed, and he wants to put the story behind him. He would like the story taken down, which Bernstein says is not going happen, just because the subject of the story is unhappy. “That just means i’m doing my job,” he said.